In my 37 years of life on our lovely, blue planet Ive yet to meet a single person who doesnt like surprises, whether they come in the form of an unexpected gift or party, or as something else. Think about Christmas as a child: Youre unwrapping your gifts, and as you tear the wrapping paper off one, you find it was that one toy you had hoped for all year. You didnt want to get your hopes of getting that special item up too high for fear it wouldnt come to pass, but there it is! Youre surprised, and it is a wonderful feeling. We all long for something unexpected, and each time we have such an encounter it leaves us yearning for the next time it happens. A few months ago marked the arrival of an Italian-made headphone amp. It was from a relatively new company called RudiStor Sound Systems. While it was a rather nice-looking amp, its looks didnt scream superior sound like those of some of the more extravagant units. The RP5.1 came with no introduction or hype. 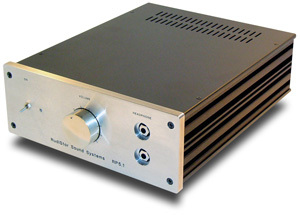 The RP5.1 is an $875 USD hybrid headphone amp that uses two 6922/E88CC twin-triode vacuum tubes for the input stage, and class-A bipolar transistors for the output stage. This hybrid configuration allows the RP5.1 to drive both low- and high-impedance headphones, and with 500mW of output power it can drive them to very high sound pressure levels. The design of the RP5.1's output stage has an added benefit in that it eliminates the need for an output transformer, making for a purer signal path. The RudiStor RP5.1 comes with a volume knob, a gain-control knob (located at the rear of the unit), a single set of RCA inputs, and dual 1/4" headphone jacks. It measures 9" wide, 3" high, and 11" deep and weighs just over 13 pounds. While the rest of the unit is done in a flat black, the faceplate stands out due to the use of elegant brushed aluminum. As an added bonus, all of the parts used in the RP5.1 are hand-matched and individually tested before being installed. As someone who has been plagued by headphone amps with annoyingly touchy volume controls, I embraced the addition of a gain control to the RP5.1. Normally the amount of movement it takes to adjust the volume is far too little, so the volume jumps with only the slightest amount of movement, making it difficult or impossible to find the right setting. With the RP5.1 you can adjust the gain to compensate for several factors: headphone sensitivity, volume-control sensitivity, CD-player output, background noise, and the sensitivity of your ears. Without gain control youre often near the lowest setting of the volume potentiometer, which nine times out of ten means you have a channel imbalance, which can be very noticeable with headphones. With the RP5.1, I found that if I simply reduced the gain of the amp to the point where the volume control is at about the 12:00 position, Ive solved all of the potential issues I mentioned in one shot. I was left with plenty of gain and a less-sensitive volume control that allows for small adjustments, and I eliminated any chance of channel imbalance. Power cords  Virtual Dynamics Master Series. After the unassuming RP5.1 made its way into my system, I plugged my Sennheiser HD 650s into the headphone jack, hit play on the remote, and just sat in my chair slack-jawed for the next six hours. My first thoughts of this amp were a combination of amazement and enjoyment. The music it made was beautiful, dynamic, and full range. To sum things up in one word -- the RP5.1 just sounded right. In fact, it sounded so right that I stayed up that first night until four in the morning, swapping disc after disc to hear how some of my favorite recordings sounded when played through it. Oh yeah, this little amp was one of those unexpected, Christmas-gift surprises. One of the rather amazing traits of the RP5.1 is just how lively its sound is. Headphone amps, especially tubed headphone amps, can sometimes sound rather slow, sluggish and boring. This is the antithesis of how the hybrid RP5.1 sounds. Listening session after listening session with the RP5.1 impressed me with how much enjoyment its lively and fast character brought. Terry Talbots guitar work on his and Barry McGuires album When Dinosaurs Walked the Earth [Sparrow TM-1001] had crispness and snap, and this created a realistic illusion that he was in the room playing. Again, each pluck of the strings sounded right, which is no mean feat at all. Many a headphone amp has failed to reproduce these notes with the proper amount of snap and attack, setting the RudiStor RP5.1 apart right away. To get a grasp on how good this amp was, I added the $549 SinglePower Audio PPX3-6SN7 to my system. During A/B comparisons I found that a couple of things stood out right away. The first was that the RP5.1 had a bit of an edge in terms of high-end extension and air. Not only was its sound more extended, but there was more sparkle to the highs. The second thing I noticed was the amount of detail and the instrumental separation. With the RP5.1 you get a little more detail from your source, and theres more separation between instruments. Each instrument and note occupies its own space, making things less congested when listening to the RP5.1 There is also a slight difference in how each amp presents the midrange. The RP5.1 has a slightly more neutral midrange. This is probably due to its hybrid design versus that of the pure-tube circuit in the PPX3-6SN7, which gives a slight touch of warmth to its mids. When it came to the bass, the PPX3-6SN7 carries a little more weight and has a little more extension than the RP5.1. To say that I was impressed with the RudiStor RP5.1 would be a rather large understatement. It arrived with neither fanfare nor pomp, but left a lasting impression on me that far exceeded what I expected. It is the liveliest, most enjoyable headphone amp Ive heard at anywhere near its asking price. If I had to choose a single headphone amp for under $1500, I would, without hesitation or reservation, choose the RudiStor RP5.1.